The reality is, companies are changing their products. It doesn’t necessarily mean it’s a change for the better. Regardless, change is inevitable and impacts every business unit and process across an organization, including the Quality Management department. In fact, Change Control is a vital part of the quality manager’s job. The FDA has certain expectations of companies and, like it or not, documenting change is one of them that falls squarely on the shoulder of QA. Unfortunately, documenting change isn’t just jotting down “changed from paper to plastic” in a notebook somewhere. Rather, the FDA has a laundry list of things the Quality department must address including: facilities and equipment, materials, production, packaging, labeling, laboratory controls, design controls, components, controlled processes, validation, computer systems, and approvals. Any change in one of these functions must be classified in one of three categories: major, moderate, or minor change. Change Control is a formal process. The challenge for Quality managers is to develop an enterprise-wide system to manage change so that no one is caught off guard when any change is requested. This can include evaluating and planning for the impact the change will have on various departments and processes within the organization. Quality is typically the last department to approve changes, and before doing so, they should review the change from every angle for any potential effect on employees, or the environment. But not all changes are planned events. Sometimes, deviations occur because of a host of unexpected factors such as safety hazards, equipment damage, human error, etc. A good quality plan will have an SOP for handling deviations. It will also plan for corrective and preventive procedures, using trend analysis. As sure as the sun will rise, eventually an FDA inspector will pay a visit to your Quality department. After exchanging a few niceties and small talk about the weather, you’ll inevitably be asked for your recent Change Control log. What he’ll be looking for is the number of change requests pending, those changes performed without the Quality department’s approval, and a system to ensure a formal system is in place to monitor and evaluate change as well as routinely check trends. You can prepare yourself for such a visit by following some industry-standard best practices for Change Control and by implementing solution automation to support the collection, tracking, management, and reporting for enterprise change control. Likewise, a good system must be dynamic and adaptable based on the various risk levels and complexity associated with a change. It should be able to be used across all types of changes, such as changes to processes, product formulations and design, raw materials, development, IT systems, SOPs, specifications and policies. 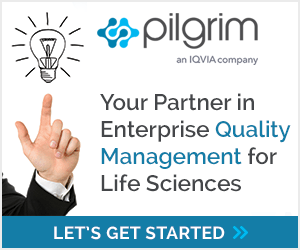 For instance, Pilgrim Quality Solutions’ SmartSolve® Change Management takes companies seamlessly through the phases of an effective change management process. Its platform integrates with other functions, including document and training management, to automate tasks and coordinate common activities across those systems as well. While an automated system eases and expedites the change process, best practices still call for periodic face-to-face Change Control meetings with Quality professionals and other departments involved. Discuss issues regarding proposed changes, regulatory requirements, and evaluate trends. Assign responsibility for tracking and monitoring changes, and even enlist a senior manager to this team. Keep everyone in the loop on outstanding requests and stay on top of your system. The biggest mistake a company can make is to underestimate the value of a Change Control system. It should be a strong aspect of the Quality department, helping to address problems you know about and detect problems early enough to keep the winds of change at bay and your operations on an even keel.